The superficial branch enters over the deep surface of the gluteus maximus muscle. The deep branch enters in between the gluteus medius and also minimus muscles. Along with surrounding muscles, the superior gluteal artery increases the circulation of the hip joint. Sections of the artery also anastomose along with the lateral as well as medial femoral circumflex arteries via the deep femoral artery inside the thigh, as well as with the inferior gluteal artery. 1.The superior gluteal artery is a concluding branch of the posterior trunk of the internal iliac artery. The artery (diameter = 4 mm) as well as the superior gluteal nerve go into the gluteal region via the greater sciatic foramen. 2. The artery routes superior to the piriformis muscle, which is where it splits into superficial as well as deep branches. 3. The superficial branch consists of the following three parts: posterior, intermediate, and anterior branches. The intermediate branch goes upwards to supply the gluteus medius muscle, a part of the iliac crest, as well as the overlapping superior gluteal integument. The anterior branch of the superficial division of the superior gluteal artery is primarily muscular and supplies both the gluteus maximus and medius muscles along its intramuscular course. This specific branch generally perforates the deep fascia near the superolateral border of the gluteus maximus muscle to supply the integument. 4. The deep branch of the superior gluteal routes intramuscularly in between the gluteus medius along with minimus muscles and also does not supply any type of perforators to the integument. 5. 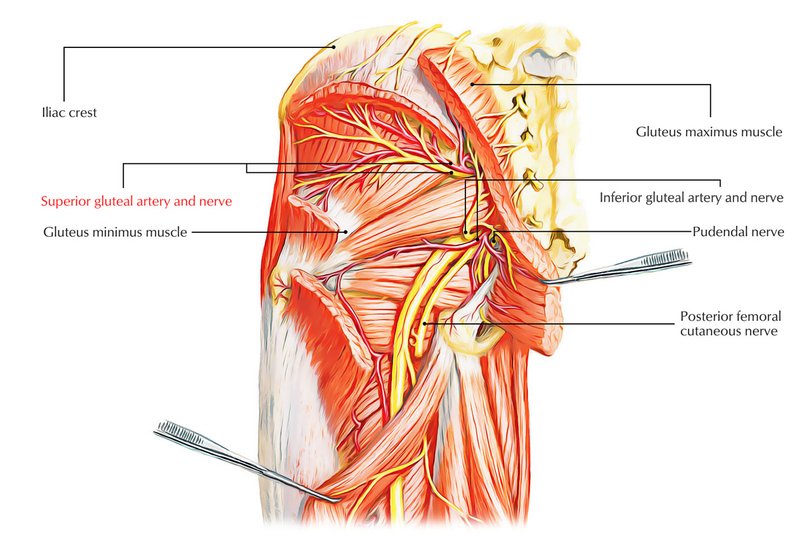 The superior gluteal artery supplies an area’ of around (40% of the gluteal region) via musculocutaneous perforators. These perforators have a really small superficial course and arborize immediately on perforating the deep fascial layer. This particular is shown by the typical perforator short superficial pedicle. The superior gluteal artery emerges as a branch via the posterior section of the internal iliac artery. It travels posteriorly to perforate the pelvic fascia in between the lumbosacral trunk as well as the first sacral nerve root (S1). It leaves the pelvis by means of the greater sciatic foramen over the piriformis and right away splits into superficial as well as deep branches upon entry to the gluteal region. The superior gluteal vessel ends at gluteal skin. It otherwise adds to two anastomoses at the anterior superior iliac spine along with the hip. The superficial branch permeates the gluteus maximus muscle, supplies it as well as the overlapping skin above the muscle’s proximal connection. Upper branch goes toward the anterior superior iliac spine as well as anastomoses along with vessels. There lower branch goes towards the hip joint and adds to the trochanteric anastomosis together with the inferior gluteal artery, medial femoral circumflex artery along with lateral femoral circumflex artery. Inside the pelvis the artery supplies the piriformis, obturator internus as well as the ilium (nutrient artery). Inside the gluteal region, the superior gluteal artery provisions the gluteus maximus as well as overlapping skin, gluteus medius, gluteus minimus, and tensor fascia lata. It adds to anastomoses over at the anterior superior iliac spine and also the hip joint.